While we continue to gather responses, we decided to share a few snapshots of the data from our Docker and Kubernetes Adoption Survey. We have gathered a total of 375 responses at our booth at two conferences (KubeCon North America and DevOpsCon Munich), an email blast, as well as from website visitors. Admittedly, our results aren’t scientific given the response bias of our audience. We’re a Kubernetes company, and most people we encounter are actively seeking information on DevOps practices and Kubernetes. Nevertheless, our data is an indication of how those who are planning or have already started their digital transformation journey are faring. As you’d expect, survey respondents from KubeCon are running more clusters or larger implementations, than other respondents. A full 58 percent of KubeCon respondents are running 6 or more clusters (30 percent running between 6 and 20 clusters, and 28 percent running 20 or more clusters). Whereas 27 percent of the other respondents are running more than 6 clusters (11 percent are running between 6 to 19 and 16 percent more than 20). While commercial platforms simplify Kubernetes cluster deployments, implementing containerized applications on top of Kubernetes in production requires a degree of internal expertise that is often lacking—Kubernetes is still new to most organizations. Interestingly, budget doesn’t seem to be a major concern. This reflects our own experience with customers who tell us that innovation and speed are driving their containerization and Kubernetes projects. Overall, primary challenges didn’t vary much based on company size. Plain open-source Kubernetes, often referred to as vanilla Kubernetes. Interestingly, the data did not indicate a predominant Kubernetes approach. While cloud-hosted Kubernetes had the lead with 35 percent, commercial and vanilla Kubernetes follow closely at 32 percent each. Also, 20 percent of organizations use more than one solution. This may indicate that either a single solution hasn’t be chosen or a requirement of fit for purpose. Six percent aren’t using any container technology at all. If we look at the data by company size, commercial container management platforms lead, with 33 percent, among large enterprises. Not surprisingly, cloud-hosted Kubernetes is the prevailing choice for small organizations—after all cloud-hosted services are quite convenient for small IT teams. 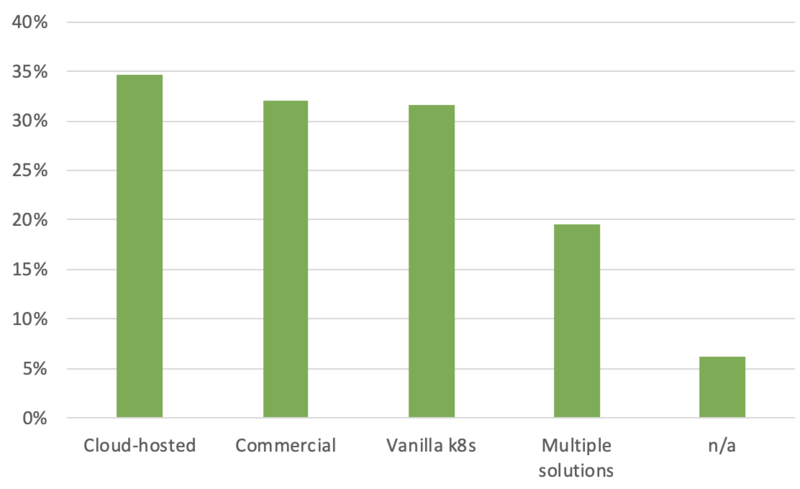 Vanilla Kubernetes deployments are most prevalent among mid-sized companies. This came as a surprise, but may be due to our small sample size and thus not representative of the industry. Selecting criteria change depending on company size. While multi-cloud is similarly weighted by medium and small companies (30 percent and 32 percent respectively), it was a more important selection criterion for large companies (49 percent). This is not surprising since large companies are much more likely to use multiple clouds across the organization. As to the ability to deploy on-premise, 44 percent of large and 45percent of medium organizations regard it as critical, whereas only 26 percent of small organization do. More selection criteria will be discussed in the final report. Although a majority of respondents are happy with their solution – 59 percent are very satisfied or satisfied – most included comments expressing the need for improvements. Ease of use, smoother upgrades, automatic rollbacks, as well as multi-cluster control plane and centralized management were some of the most common requests. We wanted to explore whether organizations are likely to run Kubernetes in production, sorted by their Kubernetes solution. Again, there isn’t a clear winner. Whether cloud-hosted, commercial, vanilla Kubernetes or those using two or more Kubernetes solutions, the likelihood is always in the 70 percent range. 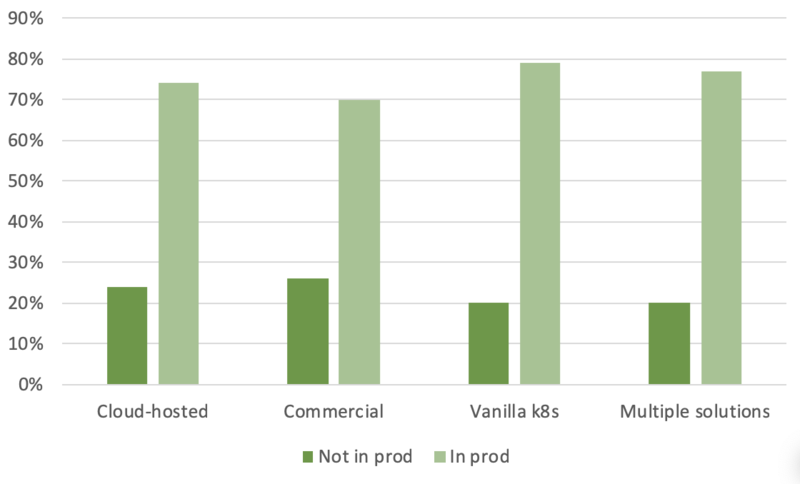 Surprisingly, those running vanilla Kubernetes are most likely (79 percent) to run in production. We looked into the link between in-house Kubernetes expertise and amount of running clusters. As expected, the more experience an organization has, the more clusters they are running and vice versa (Table 2). Microservices for all! …or a Definition Problem? It’s clearly early in the market, and organizations are still struggling with the complexity of the technology and building internal expertise. 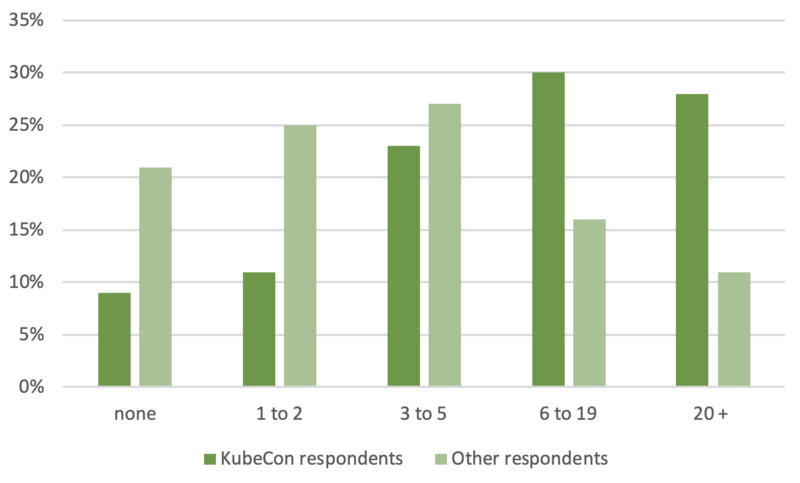 Even KubeCon respondents, who comprised almost a third of our survey responses, indicated that the complexity of the solution is a challenge. While we expected to find differences in solution choices among companies of distinct sizes, there wasn’t a clear pattern. Instead, cloud-hosted, commercial, and vanilla Kubernetes were more or less evenly used across all organizations. Platform choice didn’t affect the likelihood to run in production either. Clearly larger organizations indicate that multi-cloud and on-premise management capabilities are important, and this may change their Kubernetes platform choices going forward. The market is very dynamic, and we expect to see a lot of changes in the coming year. We Need Your Help: Please Participate! We are still continuing to gather responses. If you haven’t done so, please participate here (avg. completion ~4 min). Thanks for your support! We are also planning a follow-up survey to dig a little deeper. Let us know what questions you’d like us to ask.